I’ve never bothered with matching my nails to the festive season, or with my clothes or anything else for that matter. I was too lazy, and lacked the creativity or time to come up with something decent. This Christmas however, I received a gorgeous bottle of glitter from Cait, my Secret Santa from the forum I’m active in. I took one look at the pretty glitter and knew I had to use it for this festive period! I am besotted with it! It looks so happy and snowy and festive, yet simple and elegant. Best first self-done amateur manicure, ever! 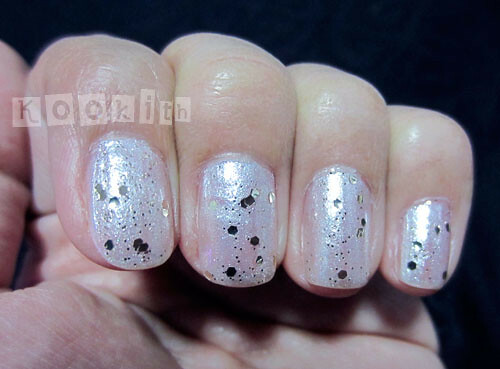 ETA [5 Feb 2012]: The base colour is Zoya Ginessa. Lovely! I like how it’s so festive and not OTT! Thanks Aud! For someone without a creative bone in her body, that was as close to Nail Art as I got!